Yes. 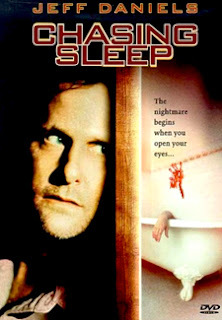 I found this movie on Netflix streaming at 5am when I couldn’t fall asleep. I’m that simple. It was either that or Wide Awake. The irony did not help me sleep. This is a play that somehow wound up on film with Jeff Daniels. The film itself seems to have agoraphobia. There are shots of the outside from the house, so we know it exists, but the camera dares not leave. It creates a mood of panic similar to that of Das Boot, but with a lot more subtlety. The film’s strength lies in never quite telling you exactly what was going on. It was forcibly shot from Jeff’s perspective, and (surprise!) he hasn’t been asleep in days. His wife has gone missing. She was having an affair with an angry Gym teacher who may have killed her. Or maybe Jeff Daniels killed her. And maybe he knows he killed her and maybe he doesn’t. The movie never lets you in on exactly what happened – and it never lets you know if Jeff knows what happened either. His insomniatic psyche becomes another character in the film.